GET UP TO $50,000 from the Government of Canada. Do you or someone you know Have any of these Conditions? ADHD, Anxiety, Arthritis, Asthma, Cancer, COPD, Depression, Diabetes, Difficulty Walking, Fibromyalgia, Irritable Bowels, Overweight, Trouble Dressing…and Hundreds more. ALL ages & Medical Conditions Qualify. Have a child under 18 instantly receive more money. 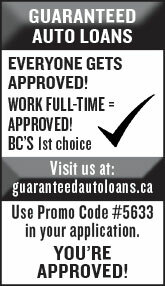 CALL BRITISH COLUMBIA BENEFITS 1-(800)-211-3550 OR Send a Text Message with Your Name and Mailing Address to (604) 739-5600 For Your FREE benefits package. SAY NO to FAKE NEWS! 63% of Canadians can’t tell the difference between real and fake news. Support reliable LOCAL journalism. Join the list www.newspapersmatter.ca. GET RESULTS! Post a classified in 97 newspapers in just a few clicks. 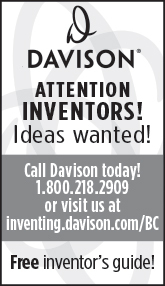 Reach almost 2 million people for only $395 a week for 25-word text ad or $995 for small display ad. Choose your province or all across Canada. Best value. Save over 85% compared to booking individually. 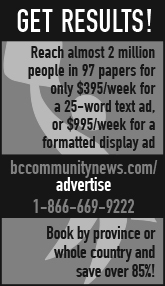 www.bccommunitynews.com/advertise or 1-866-669-9222.